Wine is showing its philanthropic spirit by pairing with (Product) Red, the effort to fight AIDS in Africa. 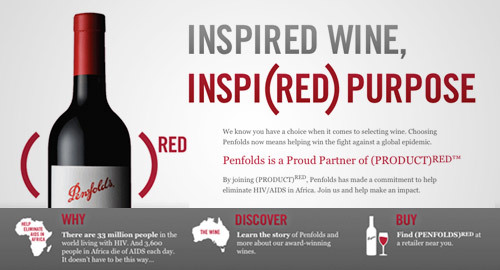 Fifteen percent of the proceeds from the North American sales of two Penfolds wines, Koonunga Hill and Thomas Hyland, will be donated to the Global fund to Fight AIDS, Tuberculosis and Malaria. This is the (Red) organization’s first alcoholic beverage partnership, as well as its first Australian marketing ally. What inspired this pairing? Francesca Schuler, chief marketing officer for the Americas at the Napa, Calif., office of Treasury Wine Estates had successfully collaborated with (Red) while working at their long-time partner, Gap Inc. She admired the organization’s ability to be a true partner to the brand and realized that Penfolds could benefit from a similar alliance as the winemaker strives for aggressive growth in the Americas. While there has been past scrutiny when alcohol is sold to raise money for causes, Penfolds disregards those concerns and actually expresses excitement about the potential of the partnership. This new relationship will serve both parties well as (Red) has been considering a wine-auction fundraiser similar to an art auction it held at Sotheby’s. Penfolds joins blue chip companies American Express, Apple, Hallmark, Dell, Nike, Bugaboo, Converse, Gap, Emporio Armani, Penguin Classics and Starbucks as RED partners. The Penfolds pairing was recently announced at the Palm Springs International Film Festival in Palm Springs, California, an event of which Penfolds in a sponsor. “Strategic partnerships, particularly in the cases of cause marketing and non-profit clients, are immeasurably important. With each partnership, the reputation and the media leverage (of the cause or non-profit) grows exponentially – making for a much stronger communications presence in the marketplace,” says Hilarie Viener, director of communication and strategic initiatives at MDG Advertising. MDG Advertising, a full-service Florida advertising agency, with offices in Boca Raton and New York, NY, specializes in developing targeted, Internet marketing solutions, exceptional creative executions and solid branding and media buying strategies that give clients a competitive advantage. To view MDG corporate identity, collateral design, signage, TV commericals and Web design, click here.